Animonda Daily Mix is no longer available. Please browse our Animonda Cat Food category for a suitable alternative. Daily Mix is a dry cat food which contains no soy, sugar, colourings or preservatives. Packaged in convenient portions to guarantee maximum flavour and freshness! 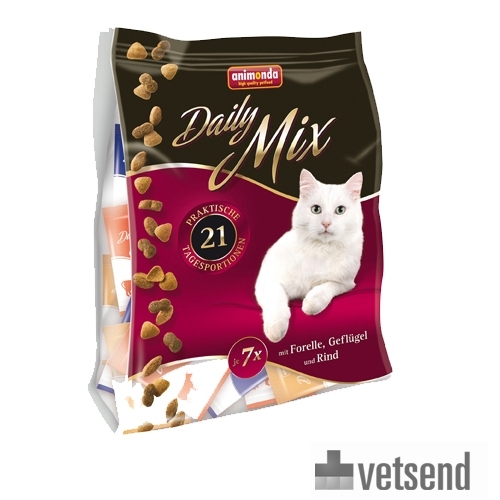 Daily Mix is a blend of 3 different dry food flavours, which are packaged in 20 gram portions. They can be used as a single meal but are also perfect combined with the Animonda Vom Feinsten wet foods. Animonda Daily Mix contains 21 practical portion bags with three different flavours: 7 x Trout 7 x Beef and 7 x Poultry. A typical 4 kg cat needs 3 x 20 gram portions a day, or 2 x 20 grams of dry food + 1 tub of 100 grams of wet food, or 1 bag of dry food + 2 tubs of wet food (200 grams). With poultry: poultry meal (27%), rice, maize, poultry fat, maize binder, beef fat, fish oil, poultry liver, beet slices, poultry protein (hydrolysed), yeast, whole egg (dried), oat fibre, calcium carbonate, sodium chloride, chicory fibre, Yucca schidigera. With trout: poultry meal, rice, maize, trout meal (10%), poultry fat, beef fat, poultry protein (hydrolysed), maize binder, fish oil, poultry liver, beet slices, yeast, whole egg (dried), oat fibre, sodium chloride, chicory fibre, calcium carbonate, Yucca schidigera. With beef: poultry meal, rice, maize, beef flour (10%), poultry fat, maize binder, beef fat, poultry liver, fish oil, yeast, beet slices, poultry protein, (hydrolysed), whole egg (dried), oat fibre, calcium carbonate, sodium chloride, chicory fibre, Yucca schidigera. Have you used Animonda Daily Mix before? Let us know what you think about this product.